"A solitaire variant requiring careful planning"
The freeware game you can download here is called Penguin Solitaire. Here on Winportal we provide you a wide range of variants on the classic card game solitaire, and here’s another one. This time it’s one that’s not so much based on luck, but one that will require planning and thought. 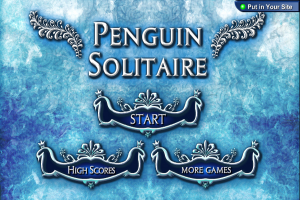 As such, the fans of solitaire games might be particularly interested in Penguin Solitaire, created by a game scholar. Without entering into the details about the gameplay, we can tell you you’ll have to move all the cards of one deck of playing cards into four foundations. Penguin Solitaire comes with a nicely elaborated graphical interface which you can preview by looking at the provided images. So, if you want some solitaire variant that requires you to plan carefully, this is your chance. It’s freeware after all thus hit the download button if interested.